Cliona Arthur from Belfast City Airport with Chris Sherrard, Editor of Belfast Live and Joanne Friel, Marketing Director at Mirror Media. Belfast Live, the website owned by Mirror Media, has launched a new brand campaign at Belfast City Airport as it celebrates four years since the site first launched. 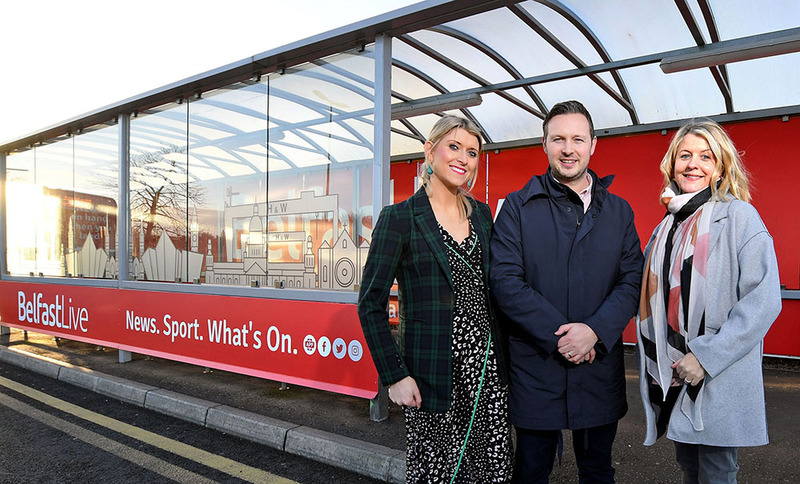 Airport passengers using the Sydenham Bypass in both directions will spot the big brand campaign by the local digital news platform which occupies the bus shelter site at the entrance of the airport terminal. According to Belfast City Airport, 2.6m passengers travel through the airport each year. The campaign aims to showcase Belfast Live’s proposition as ‘The only destination for all things Belfast’ to commuters. Belfast Live has been building its brand presence in Northern Ireland over the last four years, positioning the site as the go-to destination for what’s happening in Belfast and beyond. The publisher is supporting this identity by employing the tagline ‘News on hand when you land’ as its overarching message for the Airport campaign, tying into the travel theme.